A l'occasion de son vingt-cinquième anniversaire, l'Ensemble Stanislas publie les deux sextuors de Brahms enregistrés en concert par le Stanislas Sextet, qui est composé du Quatuor Stanislas et de deux musiciens américains, John Fadial et Beth Vanderborgh. C'est avec le premier sextuor de Brahms que leur collaboration avait commencé en 1996, d'abord à Nancy puis aux Etats-Unis, où leur interprétation de cette oeuvre emblématique leur avait valu les éloges enthousiastes du Washington Post. Cette version a été captée en mai 2008 à l'Opéra National de Lorraine, à Nancy , tandis que le deuxième sextuor a été enregistré au Recital Hall de l'Université de Caroline du Nord, à Greensboro, en octobre 2006. 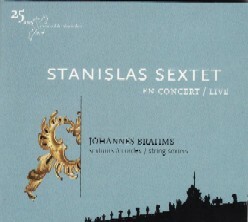 On the occasion of their twenty-fifth anniversary, the Ensemble Stanislas has brought out the two Brahms Sextets recorded during concerts given by the Stanislas Sextet, consisting of the Stanislas Quartet and two American musicians, John Fadial and Beth Vanderborgh. It is with this first sextet of Brahms that their collaboration began in 1996, first in Nancy then in the United States, where their interpretation of this emblematic work won them enthusiastic praise from the Washington Post. This version was recorded in May 2008 at the National Opera of Lorraine in Nancy, whilst the second sextet was recorded in the Recital Hall of the University of North Carolina, in Greensboro, in October 2006. Separatly they were fine; together they were excellent.(...) Brahms's String Sextet No1 in B-flat, OP.18, a large, genial piece of music, demands flourish and open heart. The ensemble brought both-with the appropriate results. The martial theme and variations of the Andante were particurlarly effective. A refreshing program like Saturday evening's concert at Queens College felt like an oasis in a town with so little chamber music... Brahms's Sextett No1 was lovingly fluid, given a crystalline beauty with a gentle blend of strings. (...) Two North Carolina artists who have enjoyed a 12-year collaboration with Quatuor Stanislas, John Fadial and Beth Vanderborgh, were to join the quartet for the Brahms sextet.As well played as was the Ravel quartet earlier, this was even richer with impeccable ensemble, rhythmic precision, technical expertise and expansive, passionate musicianship. Gorgeous music, exquisitely performed, and I do not believe I have overdone the superlatives.